Single-family or multi-family. Commercial or institutional. We come alongside you or your team to create unparalleled spaces that reflect the way you want to live today. Modern places, with a liberal use of natural materials. Places at once thoroughly local and completely current. And, of course, toxin-free by design. 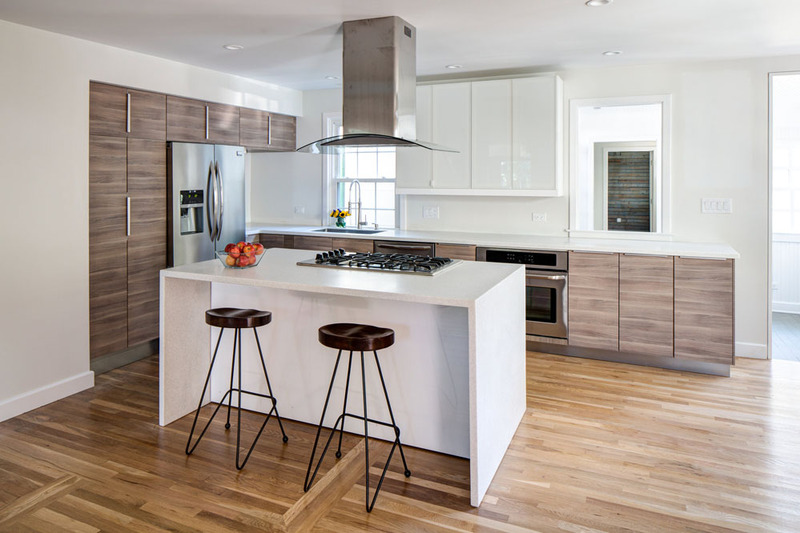 The waterfall-style kitchen island with a gas cooktop puts cooking at the heart of the family's living area. Cabinets and built-in pantry provide abundant kitchen storage. The open stair connects the main floor living area to the loft. Tubular daylights and gable windows fill the loft with natural daylight. Sustainable cork flooring and exposed roof members add character to the space. The custom-detailed steel stair maintains a light and airy appearance, especially at the post-free corners. The master bath features a glass vessel sink. Rolling glass panels conceal the laundry area and coat closet. Custom wood shutters and shutter dogs add authenticity to the exterior. Modern elements complement the original architecture. The client, a couple expanding their investment portfolio into residential real estate, wanted to re-develop this rambling 1940’s cape cod-style house into a luxury modern rental. 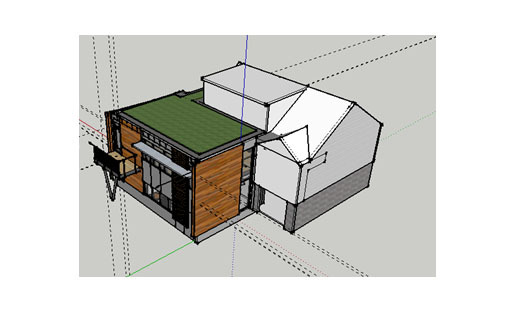 The proposed design converted a two-unit rental into a large single-family home and simultaneously converted an unfinished attic into a delightful loft-style living space. Located equidistant from downtown Charlottesville and the University of Virginia, the renovated home offers renters amenities not readily available in this sough-after neighborhood. The open-concept living area features a large modern kitchen with a waterfall island and gas cooktop. Occupying a former rental cottage attached to the cape, the large master suite features a walk-in closet and a four-fixture luxury master bathroom. The project features air-tight spray foam insulation, energy-efficient LED lighting fixtures, Energy Star appliances, ultra-low flow plumbing fixtures, zero-VOC paints, and 100% native landscaping. Salvaged wood studs from the extensive interior demolition efforts were re-purposed as wall paneling for the existing fireplace and a new built-in master bedroom headboard. Young Hemlock trees frame the addition which is clad in shiplapped cedar siding. Outdoor spaces take advantage of the native landscape and topography. The clear-finished siding of the addition complements the oiled finish of the existing cedar clapboards. A new front porch provides an idyllic place to enjoy sunrise in the forest. 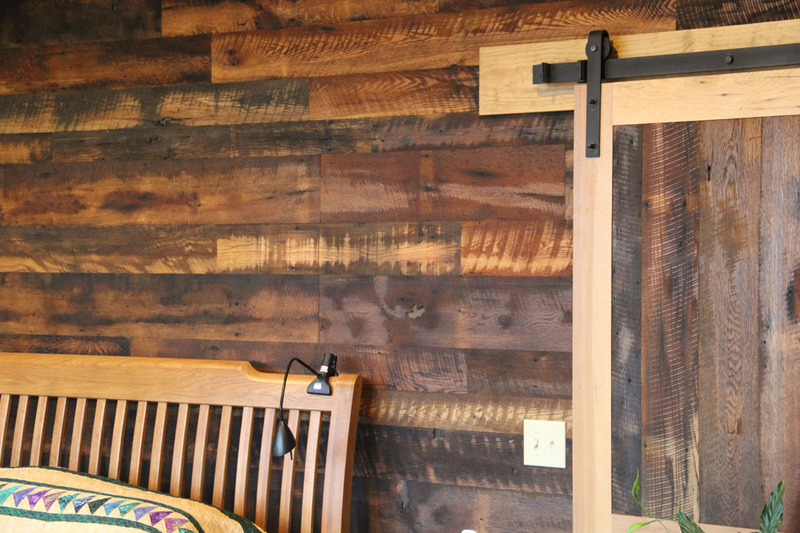 Reclaimed Granary Oak and Hickory create a unique barn door leading to the master bedroom and walk-in closets. 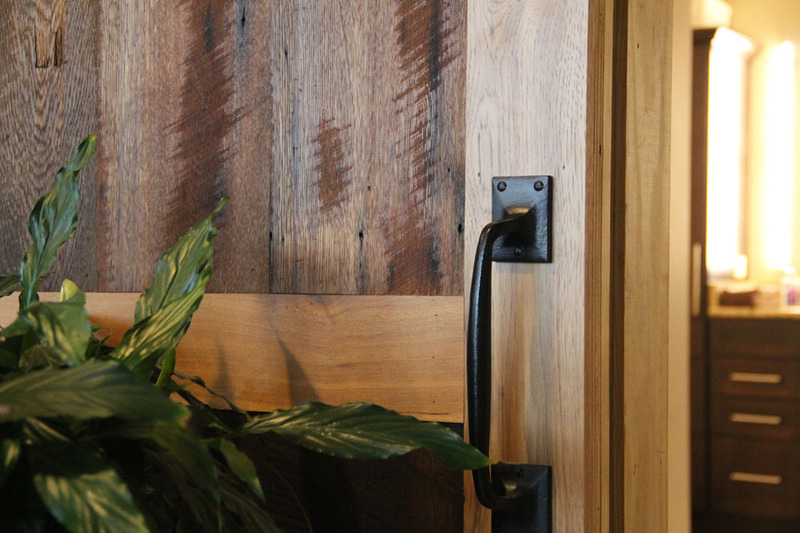 The original sawmarkings were preserved, adding character to the wood paneled wall. The forest canopy, in combination with the deep overhanging eave, minimize the solar heat gain through the large expanses fo glass. The client for Hickory House wanted to transform their well-loved existing house to support their growing desire for aging in place. The master suite addition not only satisfies their needs for universal accessibility, it unequivocally connects their new interior spaces with the gently rolling landscape beyond. The bedroom includes a large sitting area, from which the owners enjoy observing their local flora and abundant fauna. The interiors also feature three types of locally-sourced, salvaged hardwoods including native Hickory, which is prominent in the surrounding forest. The project includes air-tight spray foam insulation, reclaimed hardwoods, energy-efficient LED lighting fixtures, and low-flow plumbing fixtures. The two-story addition quietly resolves the complex geometry of the existing roof line. Stained wood siding adds warmth to the clean, modern forms. The top floor's master bedroom suite overlooks a green roof above the new living spaces. 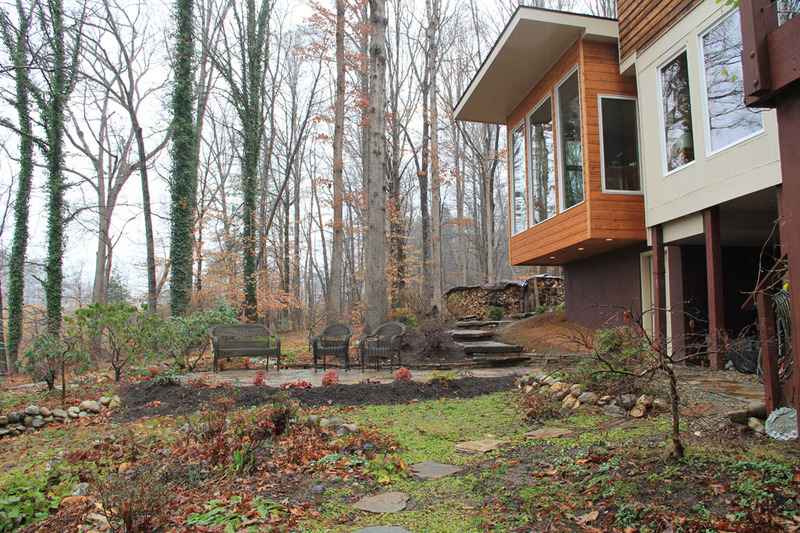 Living spaces in the addition overlook a landscape of mature beech trees lining both sides of the small stream. The client, a couple with three school-age children, wanted to expand their well-loved cape cod to accommodate the ever-expanding needs of their young family. 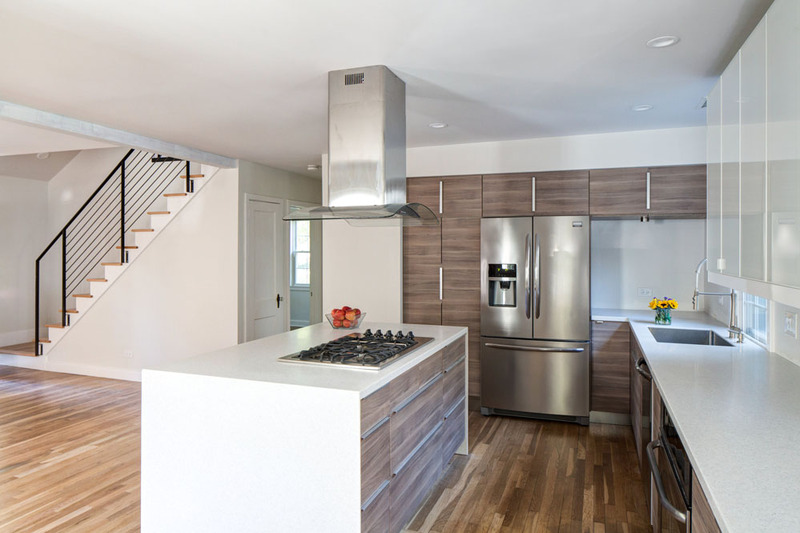 Phase one of the renovation included a full renovation of the existing house, including an entirely new kitchen and dining area and a new master suite and nursery. The latter areas occupy second floor space in a formerly unfinished attic, which now includes an expansive shed roof. The new spaces offer magnificent views of the beech tree canopies in the stream bottom behind the house. A planned two story addition will include a larger open concept living and dining area, as well as new bedrooms which overlook a native-planted landscape and the small stream. Finishes include natural cherry wood used throughout, in combination with cold-rolled steel accents and stair components. The air-sealing and insulation strategies were chosen to best suit the various areas of construction and include dense-packed cellulose insulation (existing frame walls), loose-fill cellulose (attics), and rigid rock wool (basement walls). Water-efficient dual-flush toilets and ultra-low flow shower heads have enabled the family to reduce their water usage by 28%. A perforated metal screen, with integrated signage, encloses the existing building balconies. 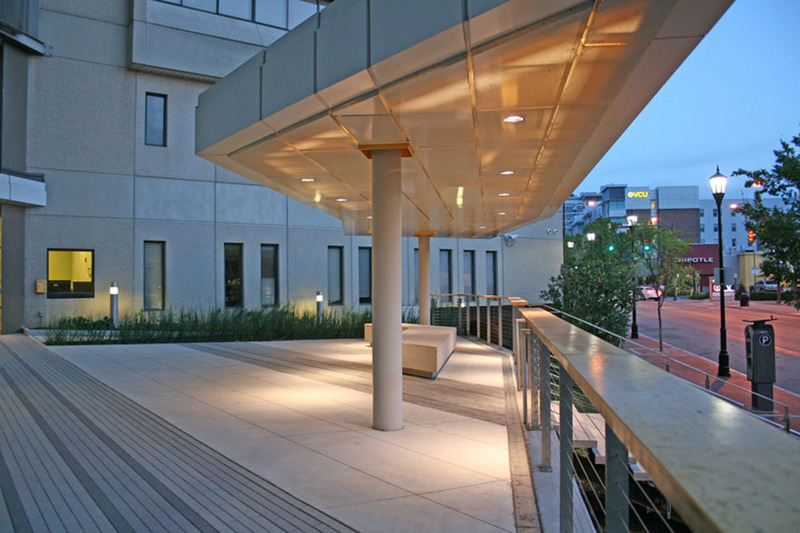 The internally-lit plaza canopy provides shelter and shade for residents. A custom-detailed scupper conveys plaza stormwater beyond the new weathering steel alloy walls and into a biofilter planted with Sweetbay Magnolia and other native Virginia plants. 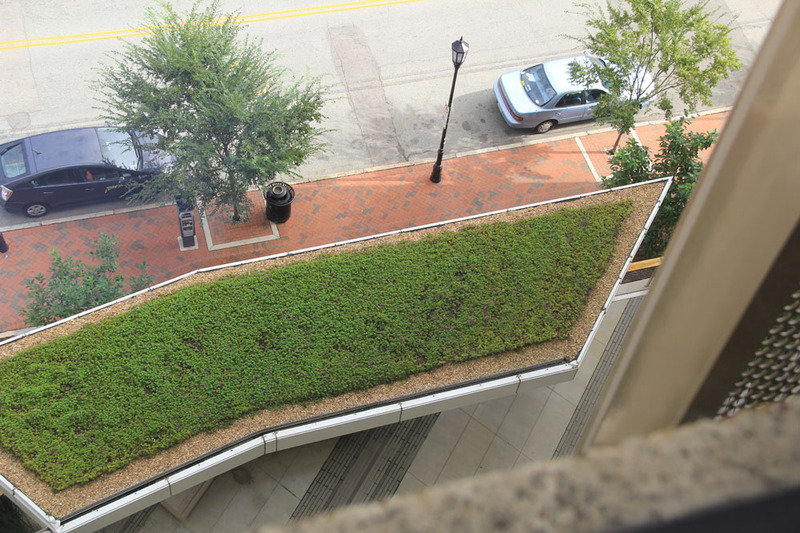 The green roof of the plaza canopy thrives without irrigation. The carefully detailed stair is composed of precast conrete and stainless steel. Native, rot-resistant locust caps the stainless steel guardrail system. 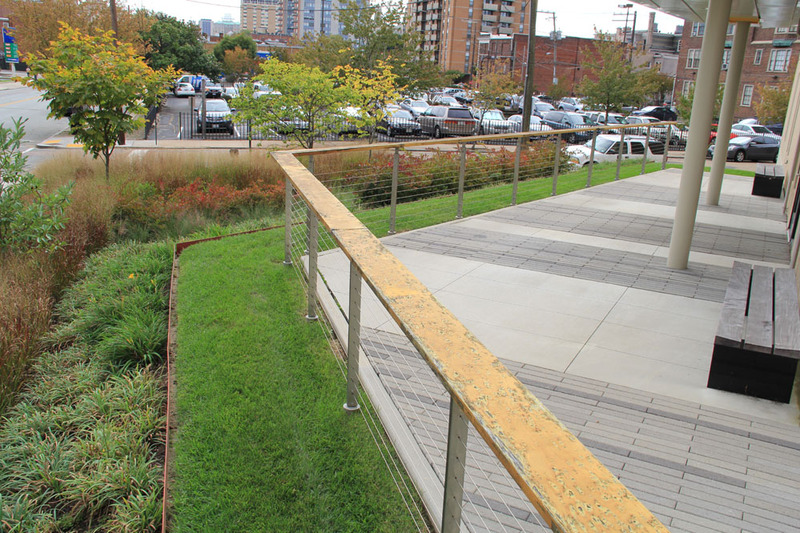 Native sedges, grasses, and shrubs define a unique outdoor gathering place in downtown Richmond. VCU’s Honors College occupies a former hospital that sits diagonally on its square city site, creating awkward triangular-shaped site areas. The renovation project demolished the old hospital entrances and created new entryways. The project also created a main gathering space elevated above Grace Street and a secondary gathering space to the east, for private functions. The canopy in the main gathering space also holds a modular green roof which students can see from their rooms above. 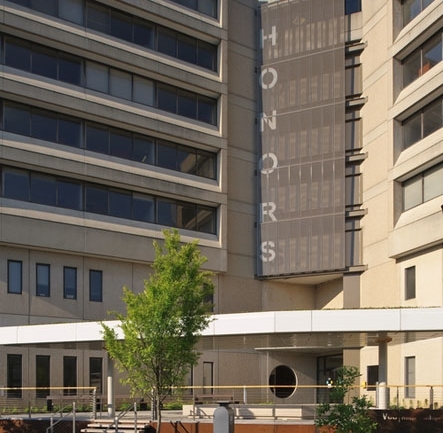 A paneled perforated screen was designed to enclose the existing balconies—creating a city scale building sign while also mitigating dangers to student residents who use the balconies. 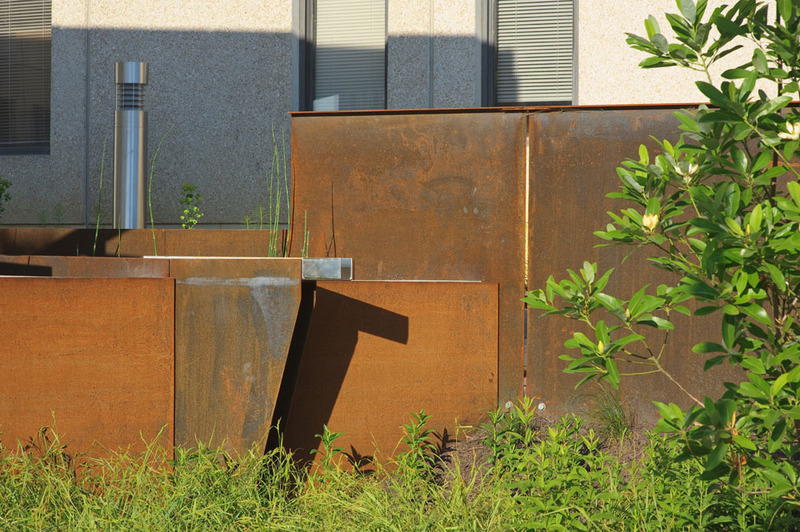 Weathering steel (Corten) was chosen as a primary material because it harmonized the warm concrete of the hospital with the red brick of surrounding buildings. The building fills a gentle slope between an existing parking lot and the resort access road. The vertical articlation echoes the form of nearby slope-side condominium buildings. An access bridge connects the upper floor to a resort parking lot. The facility is organized into two residential buildings and a support facility with a lounge and a resident manager's apartment. Near the top of the Blue Ridge Mountains, at 3200 above sea level, the living areas offer views to the valley below. Foundations are in-place and ready to receive the pre-fabricated apartment modules, shipped 110 miles by truck from Rocky Mount, Virginia. The pre-fabricated modules were erected by crane with minimal on-site construction. Stone veneer provides a tangible connection to the local physiography. 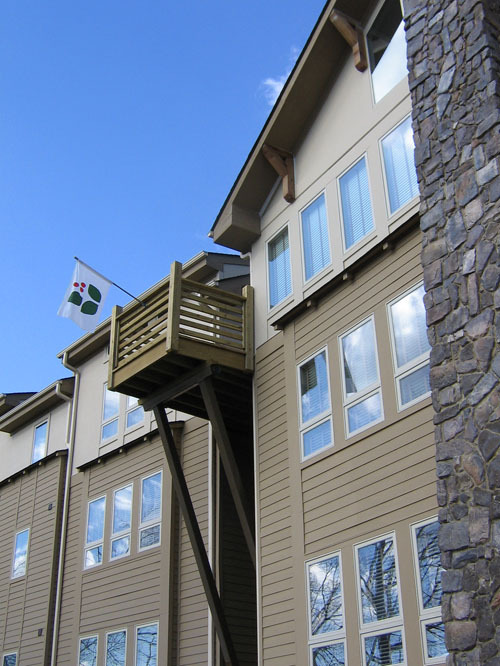 Wintergreen’s Blue Ridge Commons serves the short-term housing needs for many of the resort’s seasonal associates who arrive via cultural exchange programs. When opened in 2006, it was the first employer-owned affordable housing complex in central Virginia. Located within walking distance of nearly all of the resort’s amenities and work areas, the site greatly reduces dependence on automobile traffic. The design includes sixteen fully furnished three-bedroom apartment units—each unit sleeping six and including living, dining, and kitchen areas. The building also includes a shared commons area and laundry facilities. 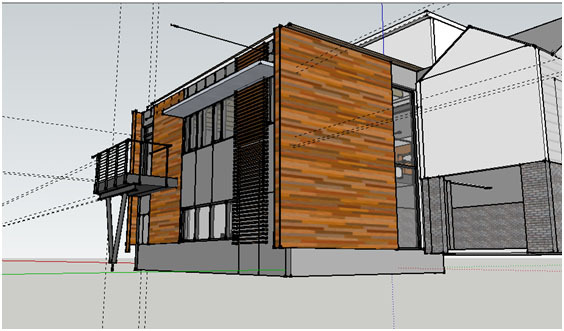 The unique modular construction method allowed the contractor to deliver the project over the course of a single “off-season”. The project is comprised of over 100 modular units factory-built and shipped to the site for rapid assembly and field finishing of joints.